Your wedding day is a special day. The LAST thing you need to worry about is the food. For your wedding, you shouldn’t hire a caterer to make your special day a success, you should partner with your caterer to make your day special. Finding a wedding caterer near your event reduces the risk of timing issues, but finding a quality caterer near your wedding venue might be tough. 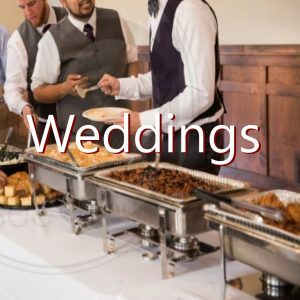 Northwest BBQ Catering works with caterers all over the place so chances are we have a QUALITY caterer close to your wedding venue. Our caterers have catered hundreds of weddings and have great references. Selecting the best caterer to partner is critical got the bride and groom. In the Northwest we have a number of great wedding venues and locations. People often talk about your special day and they will always remember the food. How far in advance should you engage your wedding bbq caterer? Really, the sooner the better. Most weddings occur during the same time, so wedding caterers have “busy” seasons. Getting your catering locked in sooner rather than later. Here is something to keep in mind. Bothering caterers with millions of questions when your wedding is over a year out might frustrate the caterer. One way to keep them engaged over the long haul is to provide them with a deposit up front. What is the best bbq menu for weddings? This really depends on your guests and location. Depending on the location, you might opt to have the caterer to come onsite to smoke or cook your food. Of course, having a caterer cook your bbq onsite will be an additional cost rather than drop off catering. Cost is a factor as well, however the menu selections that we see the most often are Ribs, chicken and pulled pork for meats. The most popular sides are cornbread, coleslaw and baked beans. This is a pretty standard, simple menu that most brides and grooms can agree on…. but hey, it’s YOUR special day the menu is really up to you. 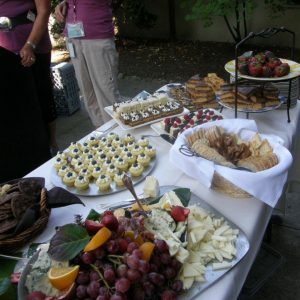 There MIGHT be menu options that certain Northwest caterers cannot fulfill, so it’s a good idea to understand what menu items you really like. Can I taste test before my wedding? All over the Northwest. From Bellevue to Vashon Island. From Issaquah to West Seattle. From Ferndale to Olympia. Eastside (Bellevue, Redmond, Issaquah, Kirkland, Bothell) is where we do most of our catering, but it’s really all over the Northwest. How can I tell if I am getting a good deal on my wedding catering? This is where we come in. We can get you multiple quotes for your event. We do the shopping and we get special deals with our caterers and pass that savings on to you! Something else to consider is that some caterers might give you a discount for booking early and providing a deposit. We know our caterers and know what they can do for you to make your wedding most cost effective. How does Northwest BBQ Catering makes money? We get a very small finders fee from our caterers for getting quotes over to them. Most of our caterers are pitmasters that love making delicious bbq. They want to focus on making great food, not marketing their businesses and getting their name out there. We focus on getting quotes over to them, they focus on getting you a good deal on delicious bbq catering. Note: Some wedding venues will not allow you to bring in your own caterer. This can be risky as you now have to depend on their in-house catering. Most of the time, that should be fine, but we suggest trying to get your wedding venue administrator to work with the caterer YOU want.